SCENARIO: you are called to the Emergency department to assess a 20 year old who fell from a height onto his elbow. No other injuries. 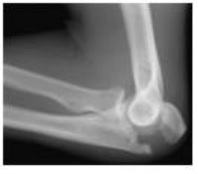 Examine affected limb - look for obvious deformity and determine if open or closed injury. Examine radial/ulna/median nerves both motor and sensation. Palpate for a radial & ulna pulses. Assess capillary refill. Type I: undisplaced. Can be treated with early movement. Fracture clinic follow up. Classified according to the direction of the distal component. Most are posterolateral. traction with the elbow flexed and then forward pressure over the olecranon. Place in backslab. Check X-ray afterwards. If satisfactory early follow up for repeat X-ray. Neurological compromise (up to 20%). Document before and after!